Below is Aaron's inventory of unused and used plant lines. If you are looking to sell your used plant line submit a request online or contact Erik Eichert at 630-238-7480. Used- Marine / Dock Side Vapor Recovery Unit (VRU). Used- Apco Propane-Air Standby Facility. Converts propane to natural gas. 50m SCFH natural gas equivilant at 1000 Btu/hr or 34.5 SCFH propane at 1450 Btu/Hr. 15 psi pressure. 556 gallons per hour propane. 19.83 MSCF per hour propane vapor. 244.16 CFM or 16.65 MSCF per hour air. 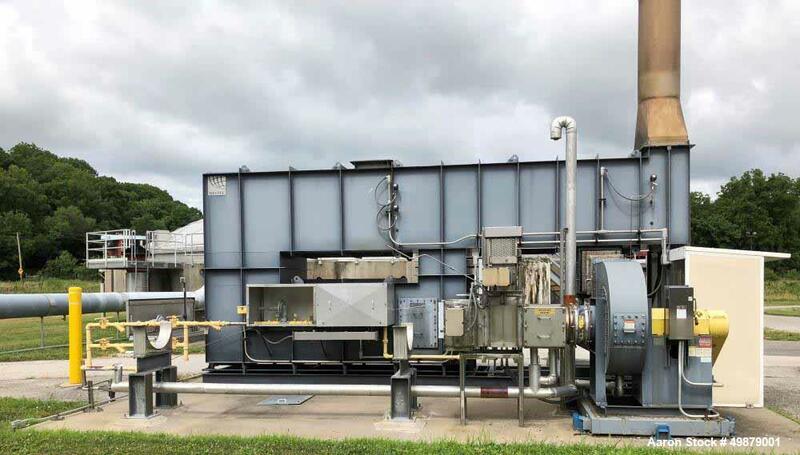 Used- CCC Thermal Oxidizer. System includes a CCC Acid Gas Scrubber rated at 500 scfm and 500 scfm Applied Membrane Reverse Osmosis Water Pretreatment System. 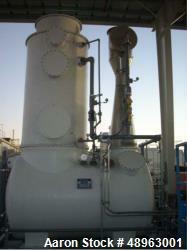 Used- Megtec Systems Recuperative Thermal Oxidizer (RTO), Model Phoenix 4000. Includes: Maxon natural gas burner. Exothermics shell and tube heat exchanger. New York blower centrifugal, Series 30 exhaust fan. New York blower centrifugal combustion air blower. Mfg. 2007. Used- Mini Blast Furnace Complex. Used- Charcoal Briquetting Line. 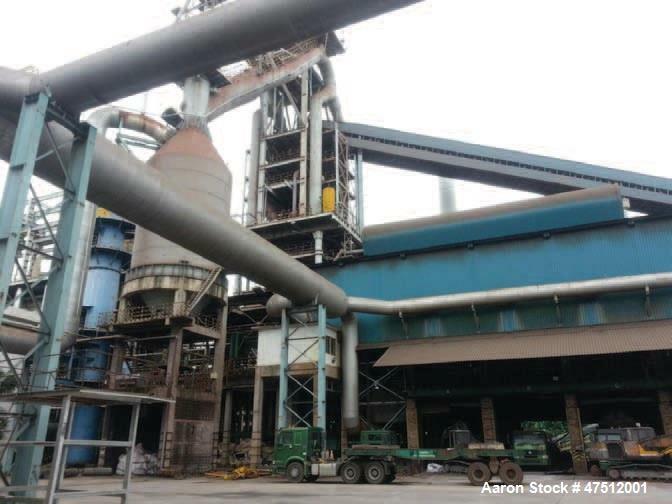 Major items include the following: Jeffery hammermill 15 hp; paddle mixer 25 hp; (2) briquette presses 15 hp each; conveyor dryer 85' long; motors; reducers; hot air dryer furnace; fans; conveyors, belt, drag, screw, etc. Capacity is approximately 1 ton/hr. Used- French Fry Line, 20,000 Pound per Hour Capacity. Used- French Fry Line, 20,000 Pound per Hour Capacity. Includes: Potato Reception/ Waste Water Treatment Equipment, Production, Palletizing, Compressor and Boiler Room Equipment, Reverse Osmosis and Water Softener Equipment, NH3 Compressors, Storage Palm Storage Tanks, etc. Used- HD PE Thick Sheet Manufacturing Line. Used- Niro Milk Powder Production Facility. Includes: (3) Niro fluid bed dryers. (2) Niro f 60 Atomizers, 45 kW. Feed air ventilator, 55 kW. Exhaust air ventilator, 90 kW. Brunner dehumidifier unit. 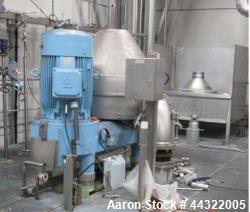 (2) mixing hoppers, (3) rotary valves, (12) pneumatic hammers, (10) magnetic hammers. Vibro sieve, air blower. 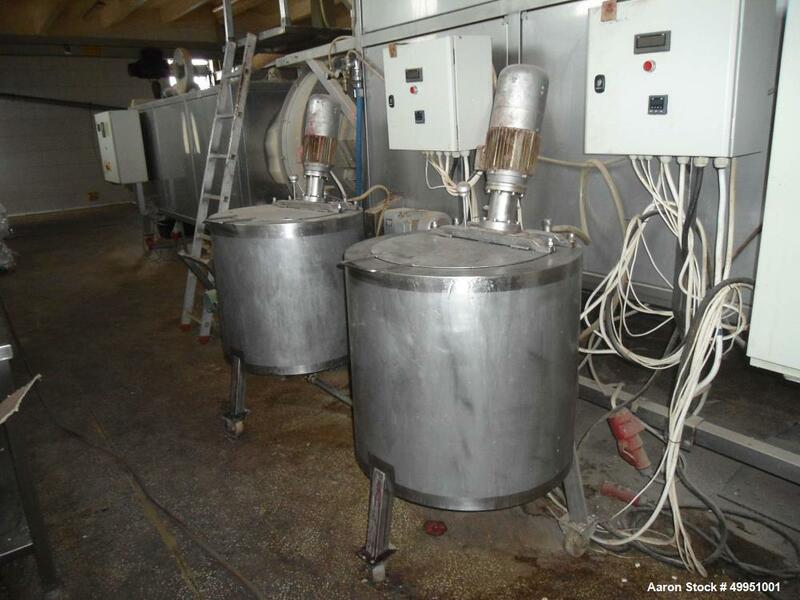 Used- Pieralisi Olive Oil Extraction Plant. 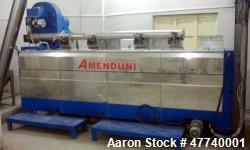 Used- Amenduni Olive Oil Line, 3 Ton per Hour. 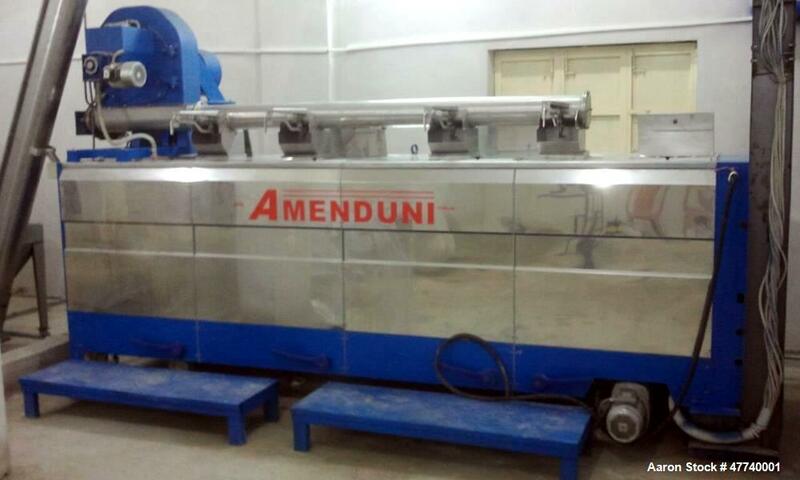 Used- Amenduni Olive Oil Line, 3 Ton/hr. 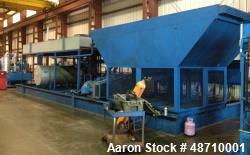 Includes: (2) Amenduni separators (2400 Lt/hr), decanter 902S, hummer mill that can process 4-5 tons/hr, malexer with (4) cabinets. 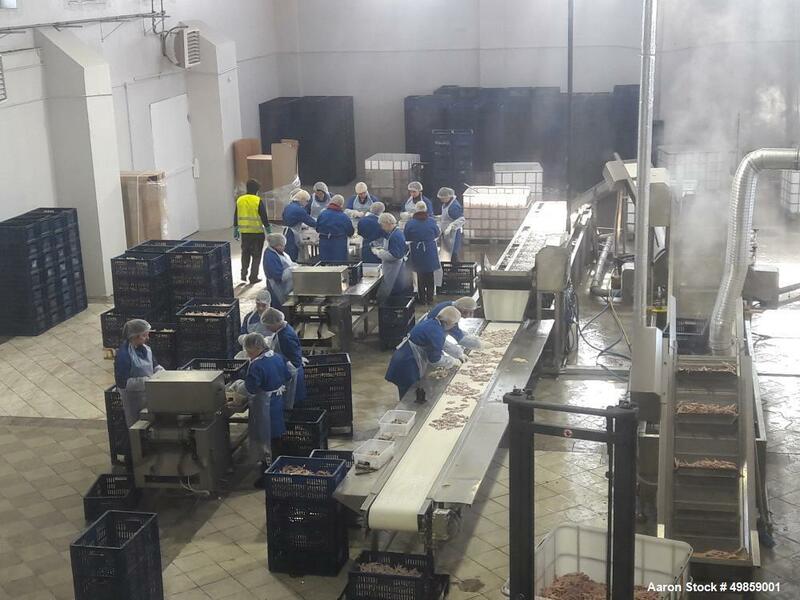 Each cabinet can hold nearly 800 kg of olive paste, washing unit, (2) olive conveyors, (2) husk conveyors, olive husk boiler. Reported to be reconditioned. 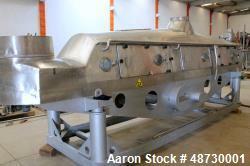 Used- Marine / Dock Side Vapor Recovery Unit (VRU). Using Lean oil absorption recovers 98% of hydrocarbons in a vapor stream of up to 1200 MCFD. Vapors from loading ship at 9,000 BPH of hydrocarbons. Unit is self-contained and needs only electricity. No emissions from reboiler. 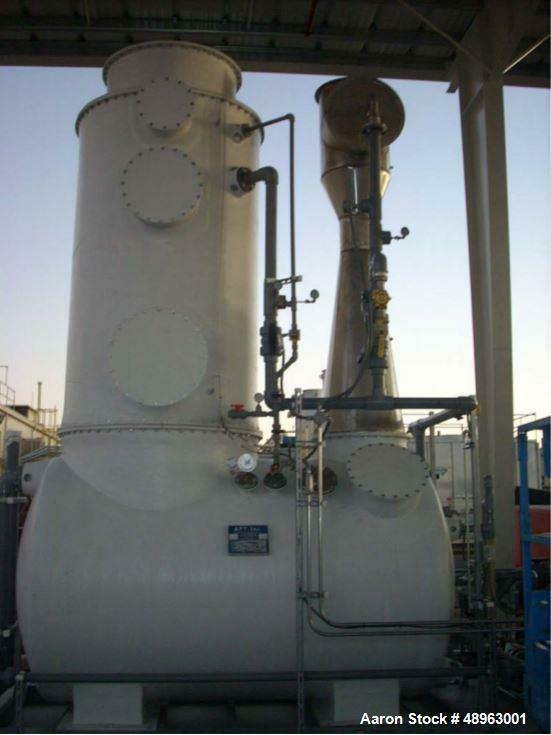 On 40 foot skid are flame arrestor, lean oil tower 30" diameter recovers hydrocarbon from vapor and sends the Rich Oil to tank on skid for processing in the distillation tower.Complete distillation tower on the same skid, 20" diameter packed with pall rings, on board rich oil and lean oil storage. Cooling fans and refrigeration unit. Towers disconnect with full body flanges at the 14 foot level for easy transportation on road. Needs new controllers. Stored inside. Year built 1996.Drawings and specs are available. Used Buzzi-Italy edible/olive oil extraction plant with a capacity of 300 to 400 tonnes/day (from pomace and seeds from waste product from virgin edible and virgin extra olive oil) consisting of: (1) Buzzi-Italy horizontal rotary dryer for biomass, (1) Buzzi double oven pass of treated biomass. 400 tonnes/day capacity. (1) Horizontal rotary dryer, externally fire heated for very wet biomass. (1) Bono-Italy steam generator, type Steam-Matic Bono, (1) Electro-filter & (2) scrubbers, to eliminate environment pollution. 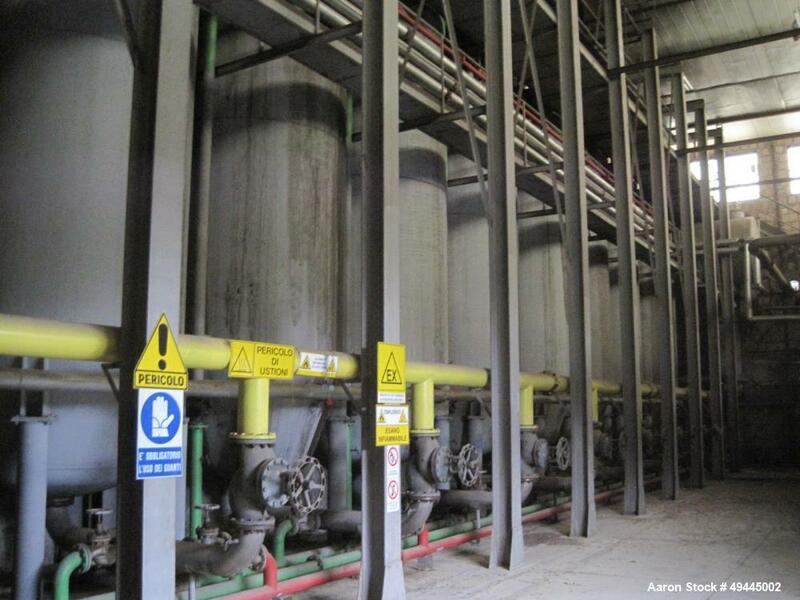 (1) Hexane vegetable oil extraction unit (1) Distiller, (1) Boiler (used for pomace oil extraction) capacity 250 tonnes/day. (1) CMB seed extraction oil system, type Simplex 40. Capacity 250 tonnes/day. (1) CEMI-Italy seeds roaster for seeds. 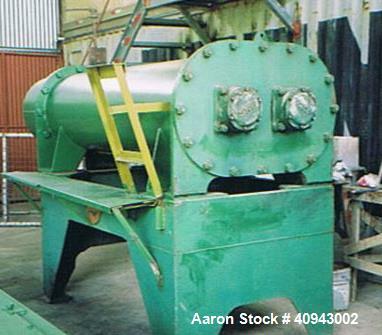 (1) Allocco-Argentina seed breaker (never used) (1) Horizontal press for pomace bricks or pellets production. Various conveyors, rotary dryers, seed mill, vertical oil tanks, ancillary equipment, additional infrastructure and computerized control system. New 1990-2007 (main equipment). Used- Ice Cream Plant. 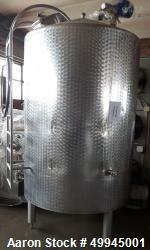 Capacity of 1587 gallon per 8 hrs. (6000 liter/8 hrs.) for filling of 0.5, 2 and 4 liter plastic boxes. 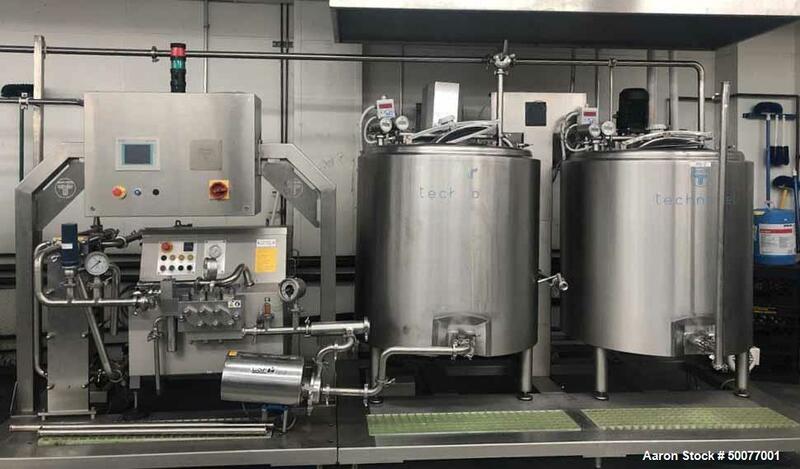 Consisting of: (1) stainless steel filling tank, (1) filler for water, (2) duplicators with mixers, 132 gallon (500 liter) capacity each, (1) Gaulin homogenizer with pump, (1) plate pasteurizer, capacity 396 gallon (1500 liter)/hr. (with automatic pasteurization). 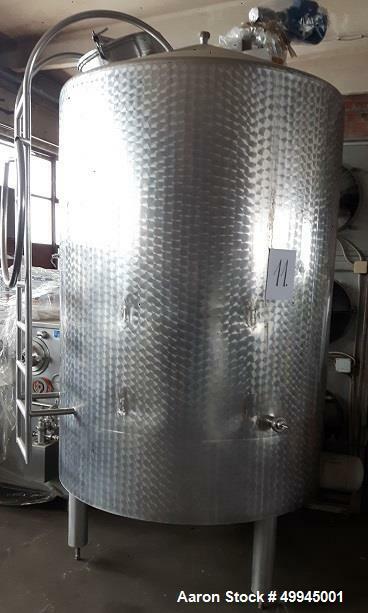 Includes pump, ballast tank, electromotor, valves, (1) Polivar CIP Station for washing, (2) stainless steel tanks, capacity 265 gallon (1000 liter) each, (2) duplicator 529 gallon (2000 liter) (connect for chilled water) 54.6"(1400 mm) diameter x 117" (3000 mm) high, (1) ZETA Group srl Italy Freezer, capacity 105 gallon (400 liter)/hr. 20.25hp/13,5kW-400volt/3Ph/50cycle, 1800 mm long x 800 mm wide x 1600 mm high. (1) Semi-automatic for filling machine for ice cream 0.5-4 liter, complete with electro box, 900 mm long x 530 mm wide x 1800 mm high. (1) "TECNOFREEZE" Italy fruit feeding machine, 1100 mm long x 750 mm wide x 1500 mm high, (1) Syrup "TECNOFREEZE" Italy Injector for syrup, 450 mm diameter x 1100 mm high. (1) Labeling machine includes LINX-JET England printer on stainless steel table, 550 mm long x 650 mm wide x (1) Bitzer MULTI set of compressors for freezing tunnel includes 3 pieces. semi-hermetic compressors BITZER, type S6F-30-2Y-40P. 2320 mm long x 1100 mm wide x 2200 mm high, (1) Evaporator for freezing tunnel, capacity 1650 lbs/hr. (750kg/hr.) with 5 fans, 5000 mm long x 1200 mm wide x 1300 mm high, (1) Air Condenser for freezing tunnel, 4500 mm long x 700 mm wide x 1200 mm high, (1) Ice bank machine, capacity 4232 gallon (16000 liter) (like new) for chilled water, complete with cooling unit. 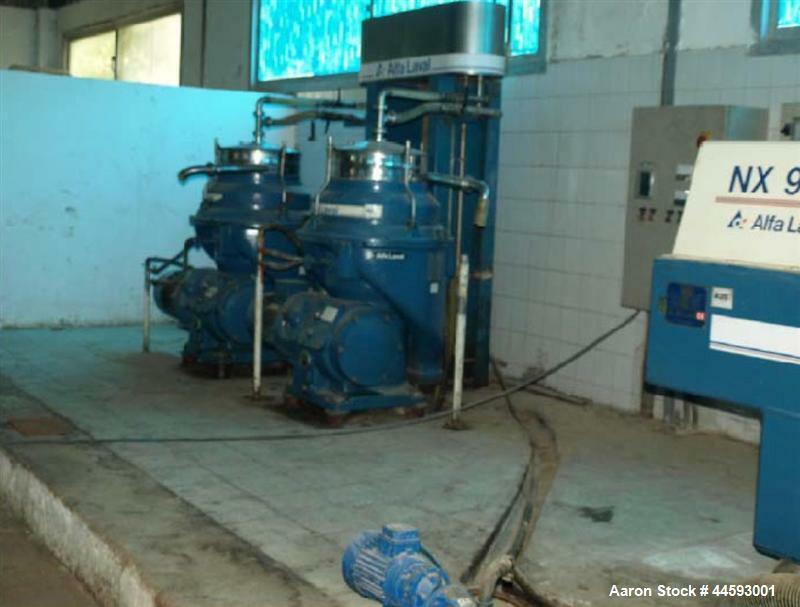 (1) Ice bank machine, Capacity 3174 gallon (12000) (old) for chilled water. Without cooling unit (cooling unit extra for outside mounted). (1) Air condensing unit for ice bank machine with semi-hermetic compressor DORIN with 6 fans on condenser, (1) Control panel for cooling system for freezing tunnel, 600 mm long x 300 mm wide x 1000 mm high, (3) CENTROMETAL boilers for prep. Used Schaaft Technologie GmbH Coating/Drying/Roaster/Cooling plant/line, type 800 PTEF for the production of sweet cereals products with a capacity of 220-330 lbs. (100-150 Kg.) per batch consisting of: (1) Schaaft Technologie GmbH combination drier/coater, stainless steel, type 265 , 31.2” (800 mm) dia. x 165.1” (4000 mm) st. side stainless steel PTEF coated drum to secure processing of extreme sticky coated product. (1) Gates 800 type 295, stainless steel for product discharge. (1) Slurry dosing/spraying system, type 356, (1) Schaaft Technologie GmbH Coating/Cooling Drum, type 372, stainless steel, 31.2” (800 mm) dia. x 117” (3000 mm) st. side. Incl. Blower 1.65HP/1.1 Kw AC motor (2) Incommunicado kettles 26.5 gallon (100 liter) with a mix and a feed heating for preparation of syrup. (1) Slurry pump, mobile on wheels, Complete with infrastructure and control panel. New year 2004. Used Cardboard Converting Line consisting of Mallet Cardboard Feeder Machine, Model FGD-1630; ULLY Auto Corrugated Trapper with Conveyor, Model TP-702C; A&E Robot Technology Robotic Arm, Type AIR50P, 50 kg Load, 2228 mm Range; Shandong Seny Machinery Rotary Die Cut Machine, Model 25001600 Maximum Paper Load 2500 x 1600 mm; Minimum Paper Load 500x400 mm; Mingle Instrument Stacker Palletizer Machine, Model MS2521-AS-525; TUV Certified. 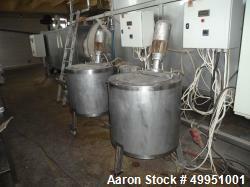 Used- Complete Ice Cream Processing Line. 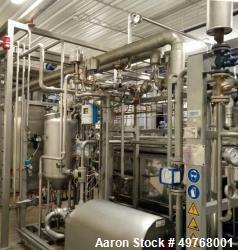 Technogel Mixworking Batch-Pasteurizing Plant with Chiller and Boiler. 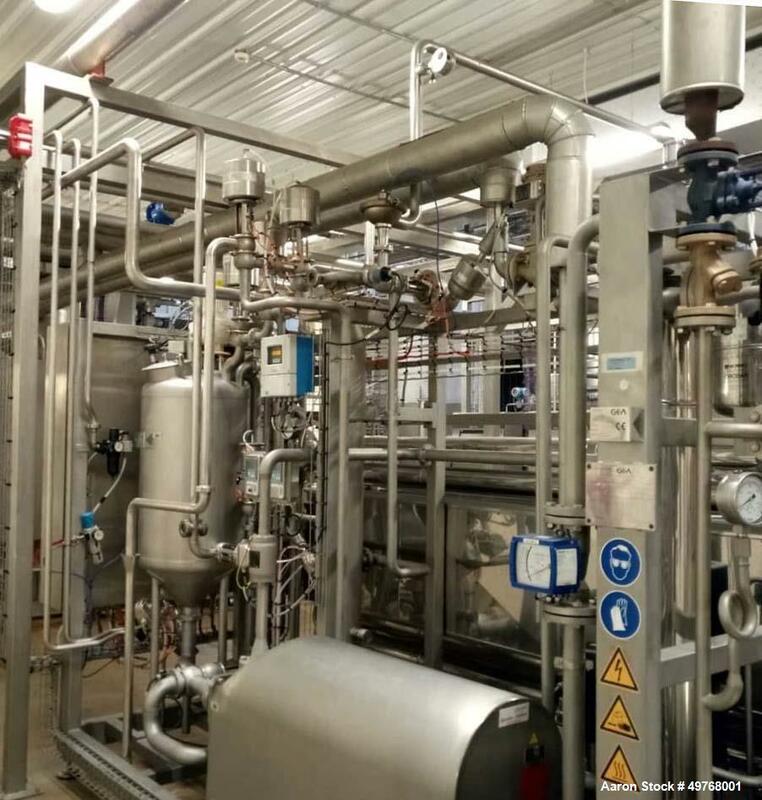 Production capacity from 150 to 600 L/h; Includes: (2) mixing and pasteurizing vats; pump to transfer the mix and a filter; homogenizer; cooling system; electrical control panel. 150 to 3000 litres Stainless Steel Vats for the stocking and conservation at +4C of icecream mix; refrigeration is carried out by means of water circulation at +2C produced by a special ice water vat; ice water runs through special steel coils on the lateral surface of the vat, insulated by injected expanded polyurethane. Technogel Continuous Freezer, Model Explorer-600, adjustable overrun between 20 and 120%; self contained cooling compressor; dasher with stainless steel scraping blades; touch-screen for the setting and visualization of the following functions and parameters: production speed, overrun, barrel pressure, viscosity, ice-cream temperature, hot gas function; memorization of recipes; CIP cycle; self-diagnostic. Technogel Fruit Feeder, up to 5000 L/h; Ripple Pump used to inject syrup and similar products into the ice-cream; consists of: vat with a discharge tap, a pneumatic volumetric pump that doses the product and a star nozzle to inject the syrup, to be applied directly on the ice-cream exit tube placed on the freezer; Pump capacity: up to 60 L/minute; Technogel Polostick Wrapping Machine, Model 1000 for the production of ice pops and ice-cream on sticks, production capacity of up to 1000 pieces per hour; electrical and refrigerating plant and its cooling system is by means of refrigerating liquid, supplied with a series of multiple molds with extractors, stick holders and defrosting tubs; Champion Commercial Dishwasher D-HBT-70 with Sink; Master Bilt Fusion Series MB R72-S 1; Master Bilt Freezer F23-S; (2) Master Bilt Freezers F49-S; (2) Master Bilt Refrigerators R49-S; Turbo Air Freezer and Refrigerator. Mfg. 2012. Used- Chicken Feet Processing Line. Meant for peeling yellow skin and cutting chicken feet to make paws. Capacity 1000 kg per hour. Food grade materials (stainless steal 304), CE certification. Includes the following: Supply elevating transporter, Scalding (blanching) tank with automatic temperature controlling and air supply, (2) peeling machines (horizontal), elevating transporter, pre-cooling tank with air supply, sorting table, (2) ankle cutting machines. All controls, 380v, 3 phase, 300 kg per hour. Space: minimum 35 x 10 m (in straight configuration). 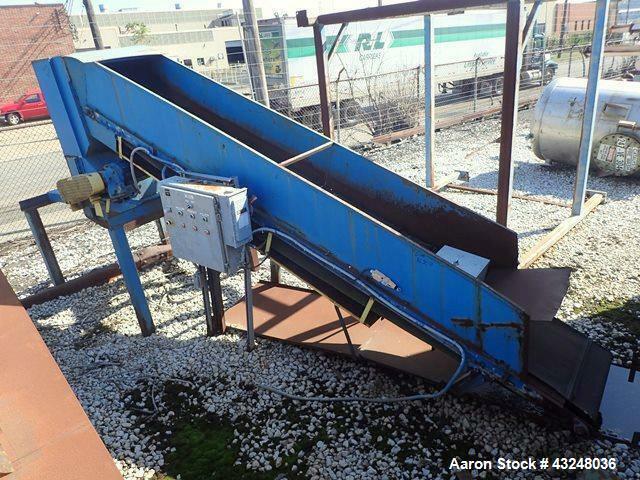 Used- Glass Crushing Line Consisting Of: (1) Approximate 3hp crusher, (1) approximate 22" wide x 28' long horizontal infeed conveyor, (1) approximate 26" wide x 156" long inclined feed conveyor, (1) approximate 24" wide x 84" long horizontal discharge conveyor, and (1) approximate 24" wide x 372" long inclined discharge conveyor. 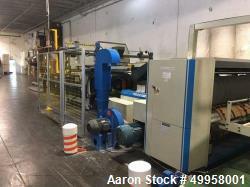 Used- HD PE Thick Sheet Manufacturing Line. High Density Polyethylene Sheet (HDPE). Manfuctured by HYPEC (KOREA). Product: HD PE Thick Sheet. Product width: Max. -1000mm. Product thickness: 4-7mm. Material: HD PE Pallet. Capacity: Max. 300kg/h. Accuracy: Thickness: plus minus 0.03mm. Width: plus minus 1mm. Length: plus minus 2mm. Machine size: 4m x 20m x 4m(Height). All motor make: Siemens (Germany). Extruder reduction gear: Highpack(Korea). Hydraulic unit: Nachi(Japan). LM Guide: THK(Japan). Electric supply: 80V,60HZ electric capacity. Total: 376kw (Motor: 249kw + heater:127kw). Water consumption:7.6m3/h. Air: 1.5m3/h (Pressure:5-7kg/cm2). Includes: Extruder: 130mm diameter. Screen changer. T-Die. 3-hi polishing roller unit (including chiller). 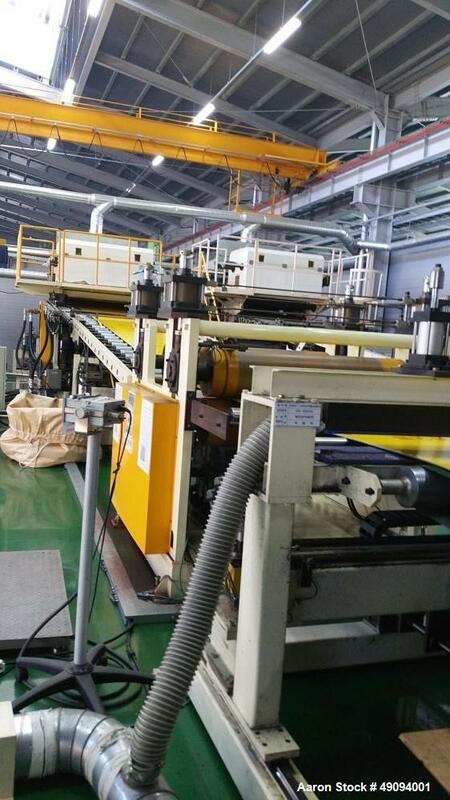 Polishing roller temperature adjustment equipment (including film lamination unit). 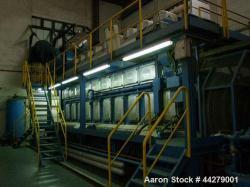 Chilling conveyor (including heating roll convoyer, cutter). Drawing roller unit. Cutting unit. Temperature control panel. Operation panel. Extruder: Screw: 130mm diameter. 200kW, 1750rpm, AC motor. L/D. 34. Oil cooling. Hopper dryer. 500kg. Temperature adjustment zone: 7 zone. Screen changer: (T-DIE). Lip width: 1150. Lip type: Flexible lip. Lip gap: 3-6mm/6-9mm. Lip width adjustment: 850-1150mm. Heater: 25kw. Cutter: Speed: 0.3-3mm/min. Cutting length: 400-1000mm. Mfg. 2012. Used- Wartsila 9L46 Plant Line, 7,760 kWe, 500 rpm. Comprised of: (1) ABB HSG 1250 M12 Generator, maximum output 9705 kva, 6000V/50 Hz; (4) Azcue water pumps, 37 kW; (20) Azcue oil pumps, 75 kW; (1) Azcue pre-lube oil pump, 25 kW; (1) Boll & Kirch oil filter; (1) GEA VT40 exchanger plate; (1) Alf Laval LOPX 709 oil separator; (2) Alfa Laval MFPX 307 HFO separators; (1) Wartsila booster module; (1) pump and HFO filter set; (3) connection and synchronization to the power grid; (1) set of dismantling tools; (1) set of spares for the engine and separators. 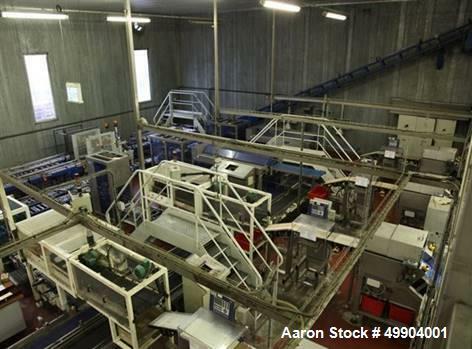 Used-Alfa Laval Complete Olive Oil Processing Line, Model NX934. 4 Tons per hour, fully automated. 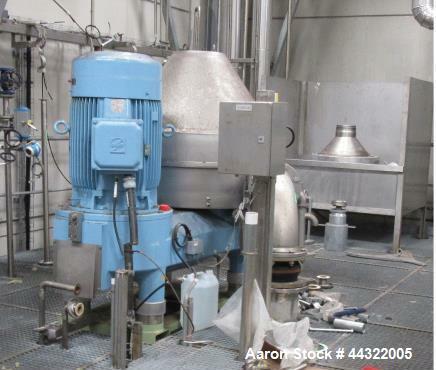 Equipment includes (2) inclined belt conveyors, (2) hydraulic super washers, hammer-mills, stainless steel auger, (3) horizontal jacketed mix/blend vessels, plate heat exchanger with pump and controls, Alfa Laval NX934 decanter centrifuge, (2) Alfa Laval separators type UVPX-510-AGT14-50, Manufactured in 1996. 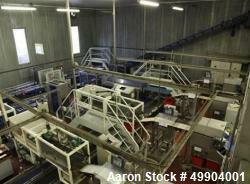 Used- Pieralisi Olive Oil Extraction Plant. With a capacity of 6 tonnes/hr. (olive paste)/140-160 tonnes/24 hr. 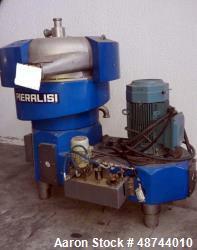 fresh olive (each line) consisting of: (2) Pieralisi olive mixers, stainless steel, 12 tonnes per batch. (3) Feed pumps, (2) Pieralisi decanters, type SPI 99, stainless steel, 60 hp main motor, new 2004/2004/2005. (2) Pieralisi Valente separators, type P6000. Stainless steel. 5400 rpm by a 15 hp motor. Includes: control panel. New 2005/2005. (2) Pieralisi Saturno separators, type Separatore Centrifuga. Stainless steel. 6480 rpm. by a 15 hp motor. Includes: control panel. New 2011/2014 includes control panels. Complete with 2 x centralized (one per line) Line control system/panel and infrastructure. 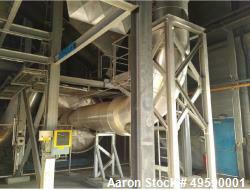 Used- Andritz Austria Continuous Sludge Drying Plant. Unit with a capacity of 2200-11000 lbs/h.r (1000-5000 kg/hr.) 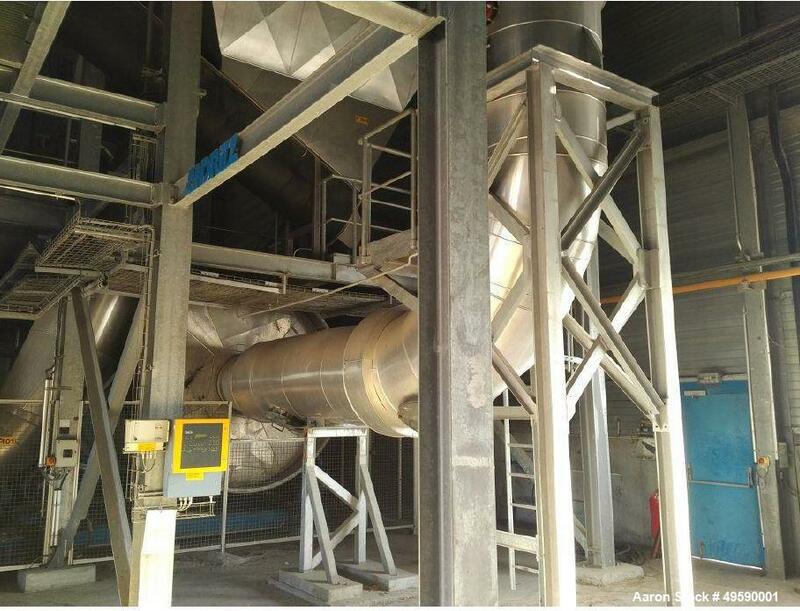 of industrial and municipal waste water consisting of: (1) Andritz DDS50 continuous drum dryer,(1) Furnace includes head, (1) (1) Exhaust gas heat exchanger, (1) Separator, (1) Condenser, (1) Heat exchanger for water cooling, (1) Cooling water pump, (1) Air cooler on legs, (1) Stack (4) outside silos on legs. Including control system, building, crane and further plant infrastructure (excluding gas engine and generator). Dryness after drying process >90 %. New year 2002.